Consumer prices rose in February by the largest amount in seven months as gasoline prices surged again and clothing costs jumped the most in nearly two decades. Despite the February blip, the recession was expected to dampen any inflation pressures for at least the rest of this year. The Labor Department reported Wednesday that consumer inflation rose 0.4 percent in February, the biggest one-month jump since a 0.7 percent rise in July. Two-thirds of last month's increase, which was slightly more than analysts expected, reflected a big jump in gasoline pump prices. Core inflation, which excludes food and energy, rose 0.2 percent in February, also slightly higher than the 0.1 percent rise economists expected. The Federal Reserve, which was wrapping up a two-day meeting on Wednesday, was expected to keep a key interest rate at a record low near zero as Fed officials continue to believe that the biggest problems at present are the deep recession and severe financial crisis, not inflation. Indeed, Fed officials have expressed concerns about the opposite problem, that a deepening recession and prolonged housing slump could push the country into a period of deflation, something not experienced in the U.S. since the Great Depression. Falling prices may sound good to consumers, but can actually make a recession even worse by dragging down Americans' wages, and clobbering already-stricken home and stock prices. Dropping prices already are hurting businesses' profits, forcing them to slice capital investments and lay off workers. Over the past 12 months, consumer prices have risen just 0.2 percent. That was up slightly from a reading of zero for the 12 months ending in January, which had been the smallest annual change in more than a half-century. 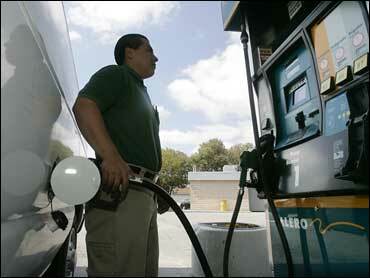 Gas prices surged 8.3 percent last month after a 6 percent rise in January. Both gains came after several months of huge declines in prices at the pump. 487359Total energy costs rose 3.3 percent in February, almost double the 1.7 percent January rise. But energy prices are still down 18.5 percent from a year ago. Home heating oil and natural gas prices both fell in February. Clothing costs shot up 1.3 percent in February, the biggest one-month rise since a 1.5 percent increase in March 1990. The gain likely reflected a rebound from steep discounts offered in January as retailers were clearing store shelves after the worst holiday season in decades. Food costs dipped 0.1 percent last month but are still up 4.7 percent over the past year. Prices for meat and dairy products fell, while fruits and vegetables rose, according to the Labor Department report. Airline fares fell 2.6 percent last month, the biggest drop since November, but new car prices rose 0.8 percent. The report on consumer prices followed a report Tuesday that inflation at the wholesale level rose a slight 0.1 percent in February. Only last summer, officials at the Fed had started to worry that a surge in energy costs could spread to other areas of the economy and boost inflation to unacceptable levels. But after the financial crisis struck in the fall, the Fed switched signals and is now aggressively fighting a deepening recession. Inflation is not expected be a problem for some time to come given the prolonged recession, which is already the longest downturn in a quarter-century.